Running game could open things up for Golden Tigers. Dusk was laying its heavy hand on Phenix City, Alabama Saturday night with the Albany State band reveling in the final notes of the Fifth Quarter. The Tuskegee offensive players had been drenched in sunshine all day long because they spent more time on the sideline than they did the field. There were hardly any bright spots to take away from their 119-yard performance. Albany State beating Tuskegee in football was seven years in the making. It wasn’t even as close as the 20-7 digits still glowing on the scoreboard. So what’s wrong with Tuskegee? Is it time to hit the panic button after just two weeks? Not so fast. Jamarcus Ezell making people forget about former quarterback Kevin Lacey after just two games hasn’t happened yet. Also, the kid forgetting how to play football himself in those two weeks hasn’t happened either. He played in all 12 games as a freshman last season throwing five touchdowns versus five interceptions. Some of his most notable play came in a shootout loss to Virginia State in which he played in place of a benched Lacey in the second half. If you rewind your mind back to 2013 Lacey only played in four games his freshman season, attempting just one pass. Even though his numbers increased every year it wasn’t until his senior year that he wasn’t throwing as many interceptions as touchdowns. High-level quarterbacks take time to develop and find their way. So Ezell needs the space to grow and learn on the job just as his predecessor did. The only catch, however, is that any loss by Tuskegee before Halloween raises eyebrows all across the SIAC. The aforementioned space can become filled very quickly with criticism and naysayers. The Golden Tiger fan base may be devout but the rest of the conference is itching for them to be dethroned. Tuskegee has no middle ground cheering section. You either love them or love to hate them. Tuskegee fans expect to win, and not just the SIAC. They consider themselves to be among the best in the country. Here’s what we do know about Tuskegee’s offense after two games. If you give them an opening they will quickly exploit it, in each of their first two games they’ve had touchdown scores of 50 plus yards. The unanswered question right now is what can they create for themselves against stingy and disciplined defenses. After two games they are currently ranked last in total offense and second to last in rushing offense. If Tuskegee can get some traction with their running game don’t be surprised if you see the passing game pick up as well. I’m no football guru but I’ve learned enough from my couch to know that if the defense isn’t worried about your running game, they can afford to put resources into shutting down your passing game. Ezell has a certified speedster on the outside in Peyton Ramzy, who also happens to be the grandson of head coach Willie Slater. That guy made a name for himself with a dive into the Alabama State end zone after catching a 55-yard bomb from Ezell in the opening week. Without a diversified attack to keep defenders honest, Ramzy could find himself in a double coverage sandwich all season long. Tuskegee may not win it all this year, they haven’t won a SIAC Championship in the last two seasons. Every year, however, you either have to beat them in the title game or the road to get there goes through them. They are certainly an eternal contender. Willie Slater will have his work cut out for him this weekend preparing for Clark Atlanta. In just two weeks they’ve already pulled off a fourth quarter comeback and a 55 point scoring fest to reach 2-0. Never mind the fact that the SIAC Preseason Player of the Year, Johnathon McCrary, has been engineering it all for the Panthers. If Tuskegee falls on Saturday, two consecutive losses in the SIAC will take things past the eyebrow raising stage. It could very well happen. But you don’t have to look any further than last year to remember that starting fast or slow can have very little impact on who plays in Montgomery in November. Fort Valley State didn’t wake up until halfway through the season, just in time to start winning divisional games, the ones that really count. Still, there’s more at stake for the Golden Tigers. They’ve proven themselves to be a NCAA Playoff contender, even in years when they miss the mark on a conference championship. While a slow start to the season doesn’t preclude you from conference considerations, getting too far behind in the regional polls will certainly keep you out of the playoffs. Until the rest of the SIAC West shows that they have Tuskegee’s number, they are still contenders for the championship this season and maybe many more to come. If the Golden Tigers expect to remain a relevant team in the national conversation for this season, however, Saturday’s game will be a compass for the direction that they are heading. 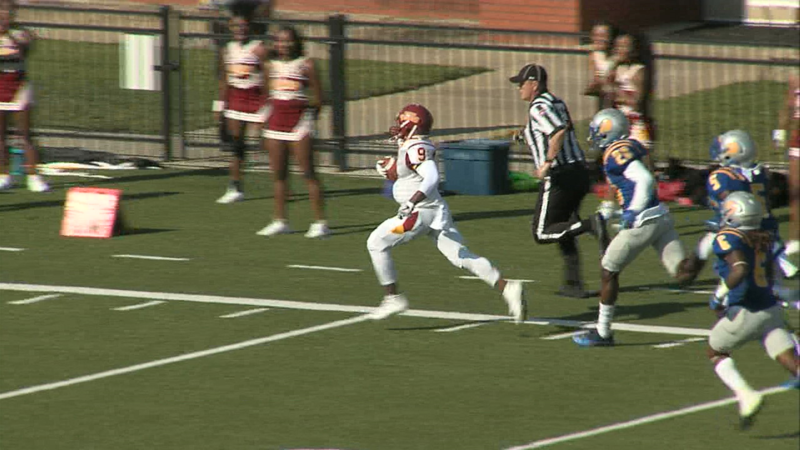 Golden Rams fail to get on the scoreboard against Skegee defense. Coaches talk but players will have the last word.